all hail the summer fideos! I kind of feel like a teenager on some MTV show, but I want to send a shout out to John Gorham of Toro Bravo for continuing to blow our minds with his amazing food. Actually, this is pretty appropriate given that anytime I am around John I feel like a teenage girl who is seeing the Beatles for the first time (a somewhat dated analogy I know, but those who know me would agree that I'm pretty old fashion). Toro Bravo, we thank you. 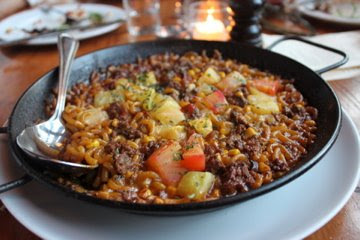 On my top 5 all-time best meals in PDX would have to be Toro Bravo's paella. I've eaten Paella on the Costa de Valencia and Toro Bravo's is just as good.